First off, better late than never, right? 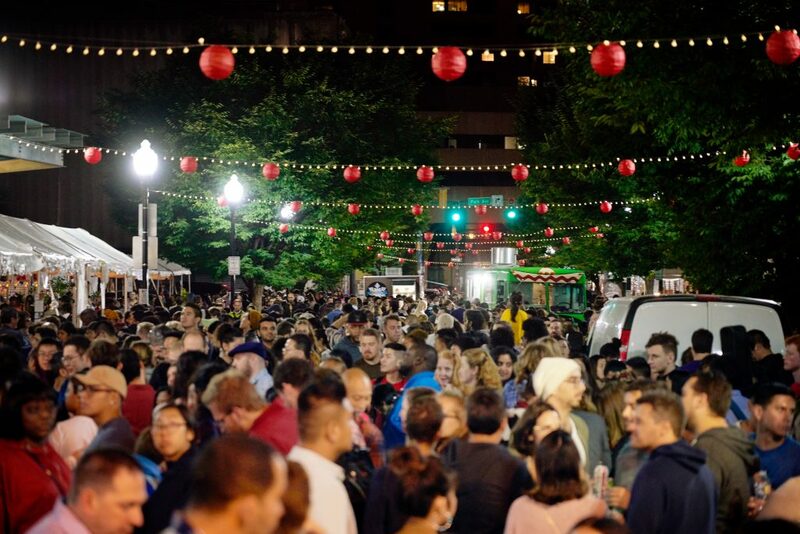 Second off, if you want a recap and a slight backstory of the Charm City Night Market, Jesse Wu did it best. 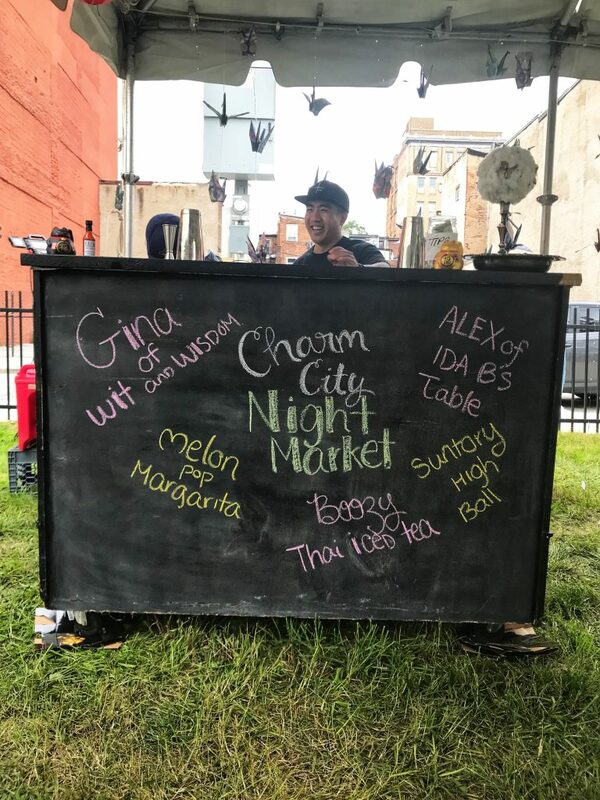 Click the link for his article: www.jhunewsletter.com/article/2018/09/first-charm-city-night-market-highlights-baltimores-chinatown. If you would rather prefer an amazing video so you can feel like you were there, click here! Props to Justin Chen for making this beast. 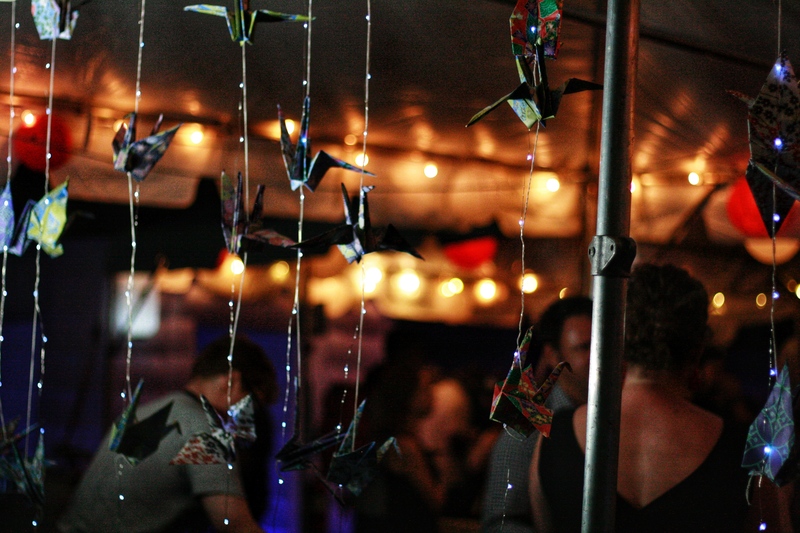 So with all that that aside, who went to the first Charm City Night Market? Wasn’t it spectacular? I gotta say, for the first time around, it was legit. 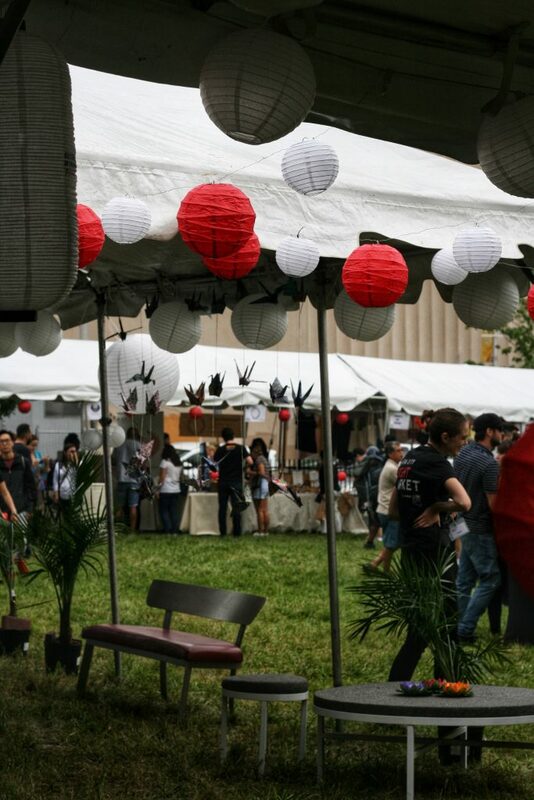 There were vendors from Baltimore and outside of Baltimore, Asian owned businesses selling their artwork and their crafts, performances, and a VIP tent! photo credit: Jamie from @jamiesumague. Website here. 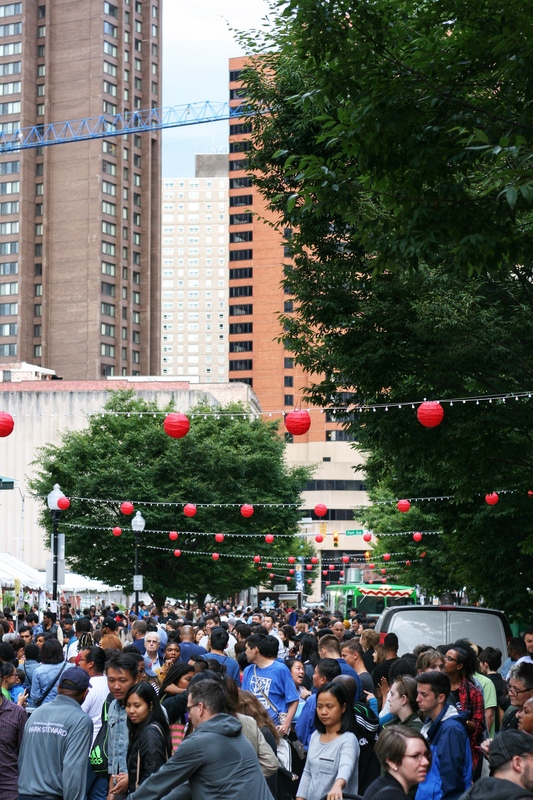 The Chinatown Collective did a tremendous amount of work leading up to the event from getting the permits, acquiring sponsorship, holding fundraisers, making shirts, asking vendors to participate, etc. For a core group of eight people, they killed it even though they were freaking out internally (I remember Leandro Lagera, a member of the Chinatown Collective, kept repeating “anything could happen with a crowd over 5,000 people in one block” that whole week leading up to the Night Market). 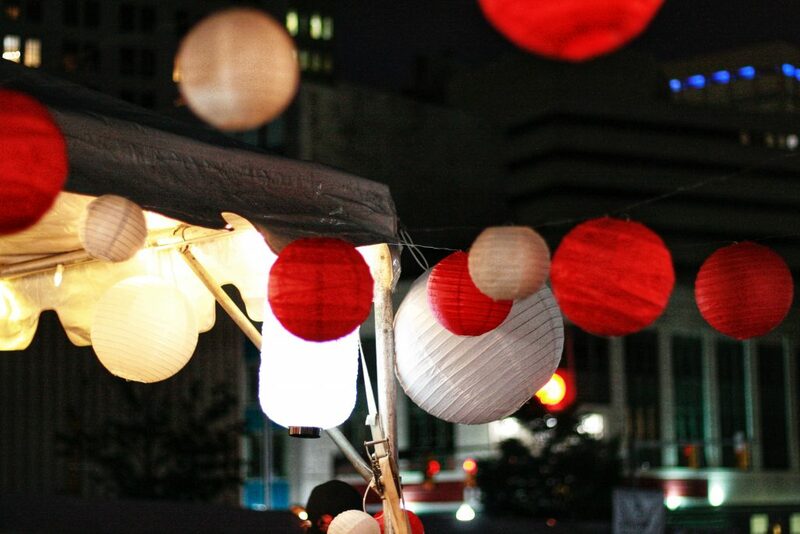 The success of the Night Market has attracted so many businesses to participate next year. Literally right after the Night Market ended, Stephanie Hsu, the founder of the Chinatown Collective, was saying how people were walking right up to her and the other members of the Chinatown Collective, asking if and how they can participate the following year. When Dave and I got to the event around 5pm, I was not expecting for 200 Park Avenue to be packed already (the event started at 4pm). 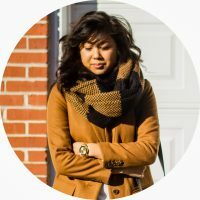 There were already lines on lines on lines for Kuya Ja’s Lechon Belly (an awesome Filipino restaurant located in Rockville, MD), PekoPeko Ramen, Ekiben, Alpaca Dessert, and many more! 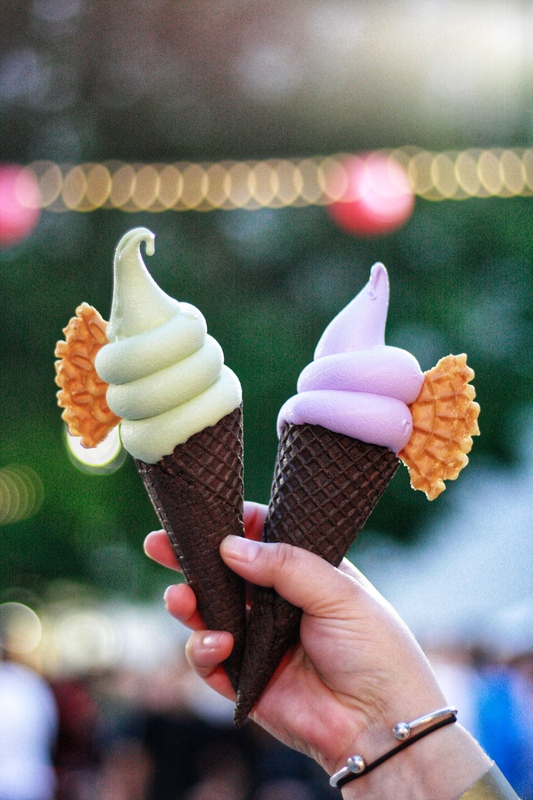 I wanted to go in line for Bmore Mochichi so bad, but I wasn’t willing to wait in line for an Ube/Matcha Swirl. When I look back, I do have regrets hahaaha. Just in general, so many people waited in line for their food. 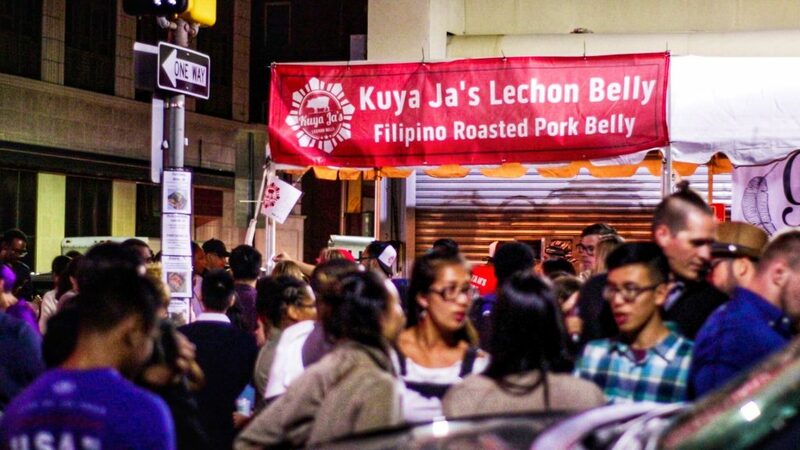 From what I heard, someone waited in line for Kuya Ja’s for 2 1/2 hours and said that the wait was worth it. 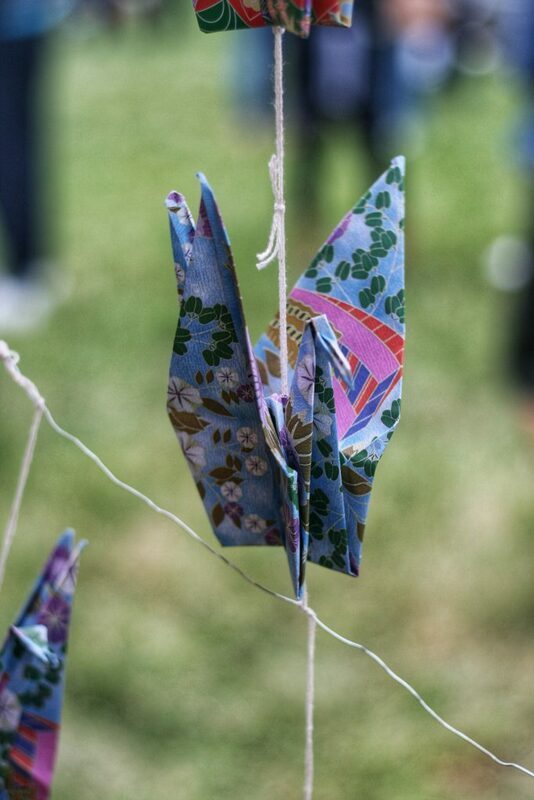 The variety of art/craft vendors were great too! 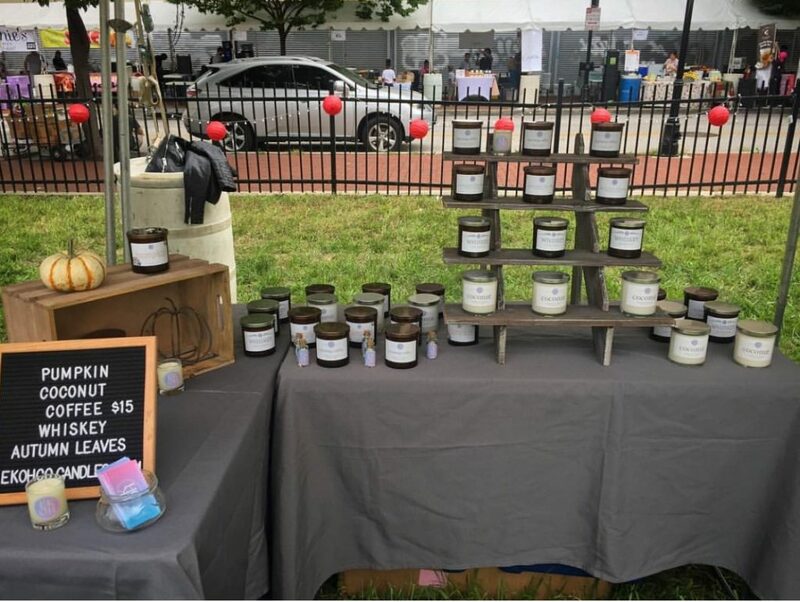 I ended up buying a coffee scented candle from EKOH Candles, which is a small, minority, woman-owned business. Also, Elizabeth, the owner, founder, and candle maker of EKOH Candles, is just an adorable, crazy drive, awesome person 🙂 If you want to check out her candles, click here for her website! I also ran into a bunch of plushies that a vendor was selling. One was a dog, and I wanted it so bad. It even had a handkerchief around its neck. SO CUTE. I didn’t get it though. I believe that I will find one that’s better one day lolol. Kimchi Juice was also there. 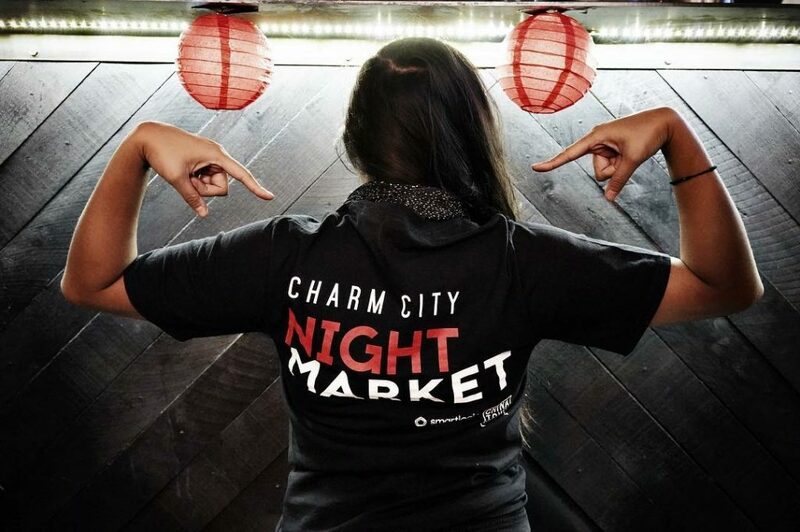 This artist created the logo on the t-shirts for the Charm City Night Market. See shirt design below! 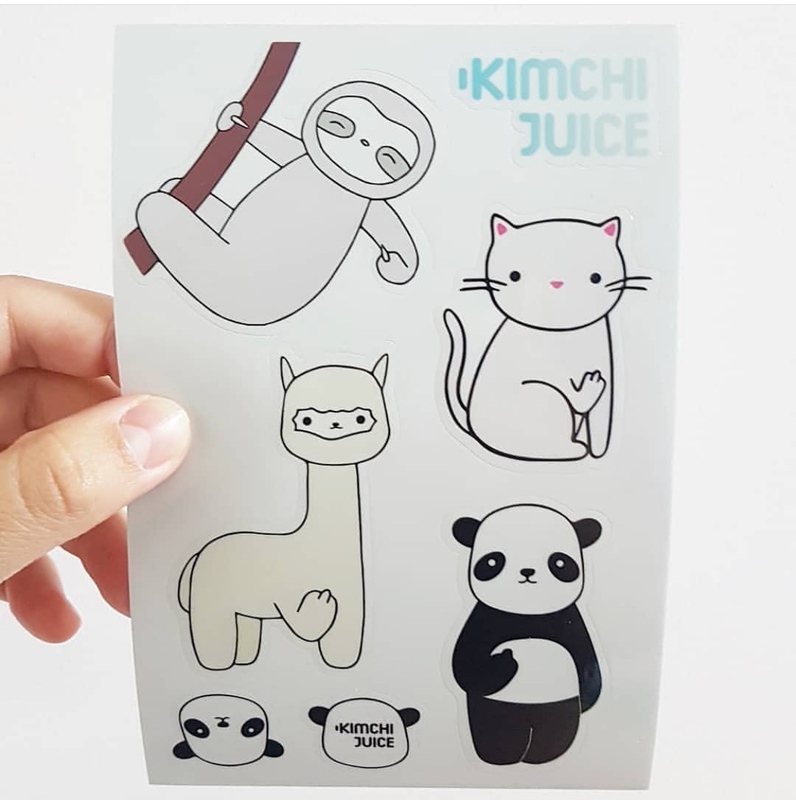 I ended up buying some stickers because it had a cute looking sloth sticking up the middle finger very subtly (that is Kimchi Juice’s branding…. cute animals sticking up a middle finger lol). Dave ended up buying a panda shirt. He loves it. 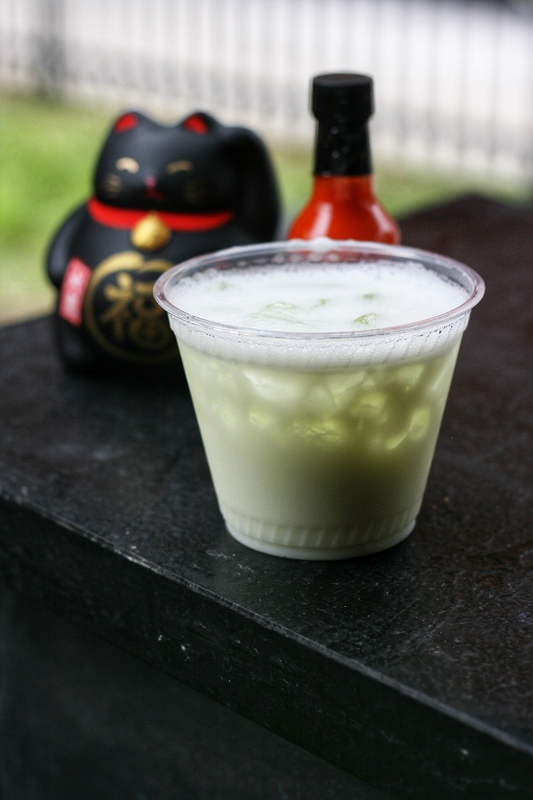 If you want to check out Kimchi Juice’s website, click here. 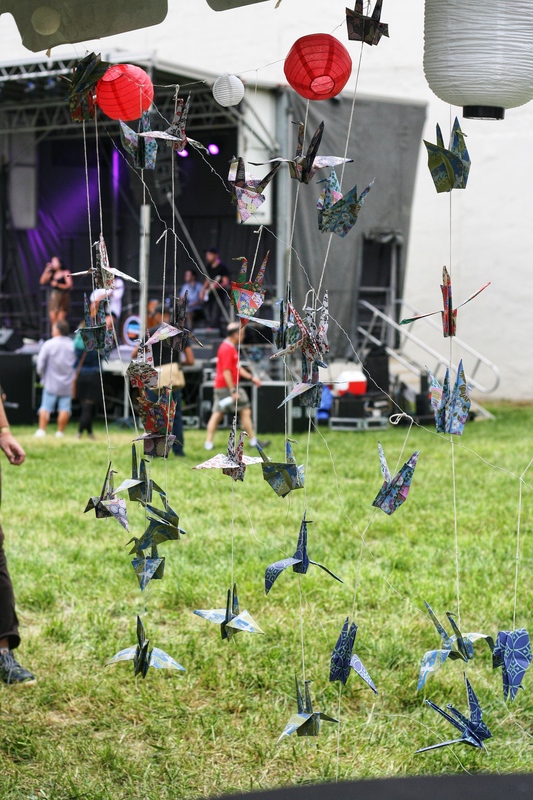 After perusing the art and craft vendors, we spent the rest of our time chillin’ in the VIP tent, making friends, catching up with friends, eating food, sippin’ dranks, and stepping out time to time to watch performances. The VIP tent was fantastically great. 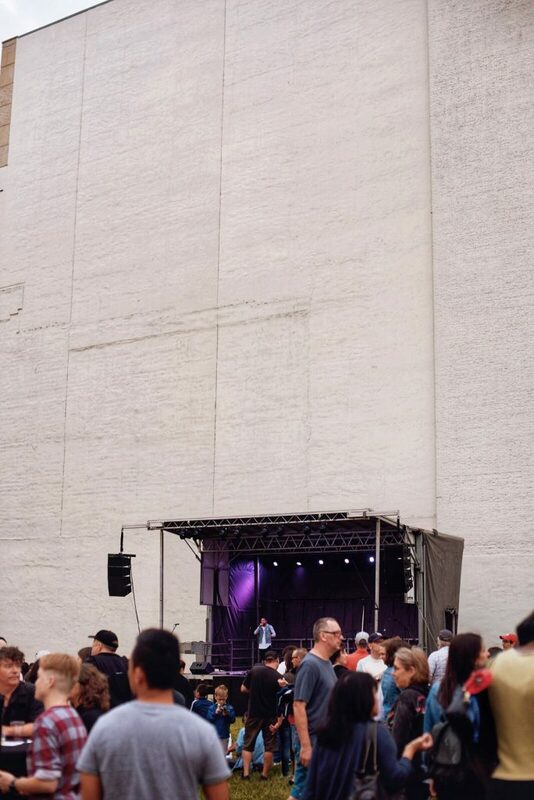 You paid only a set amount to get in and you got (basically unlimited if you were sneaky like me) food and drinks. 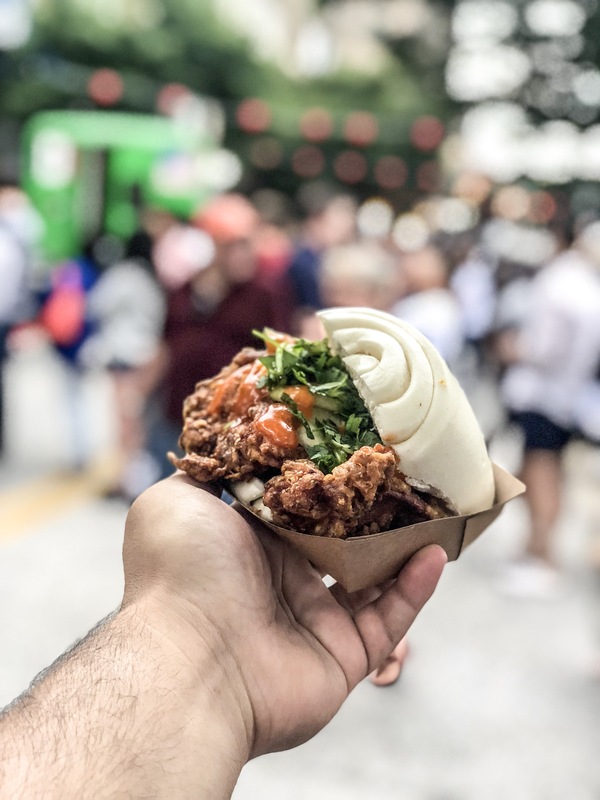 Kaliwa (a Korean, Thai, and Filipino restaurant in DC that was recently named to the Michelin Bib Gourmand list) was the one and only featured restaurant in the VIP tent and for good reason: they’re freakin’ amazing at what they do–both inside the kitchen and the front of house. They did a great job serving everyone who stayed in line with great smiles! 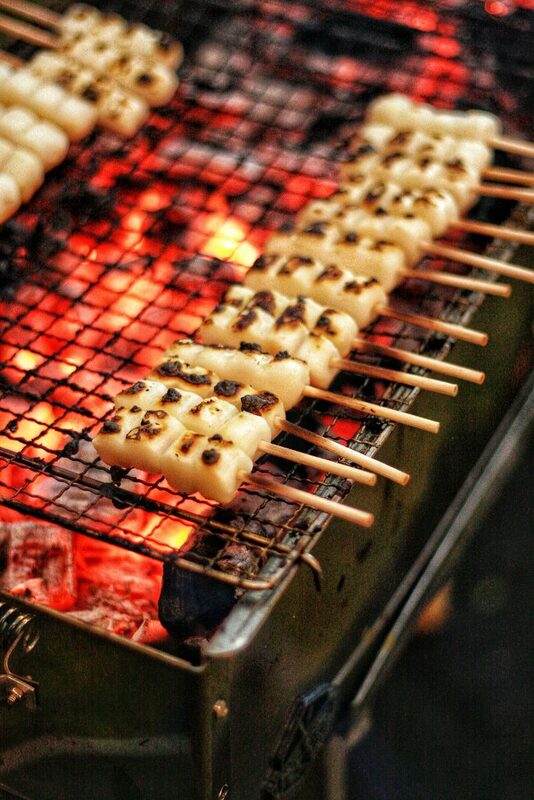 By the way, whoever came up with the idea of serving skewers to match the ambiance of the Night Market is a genius. 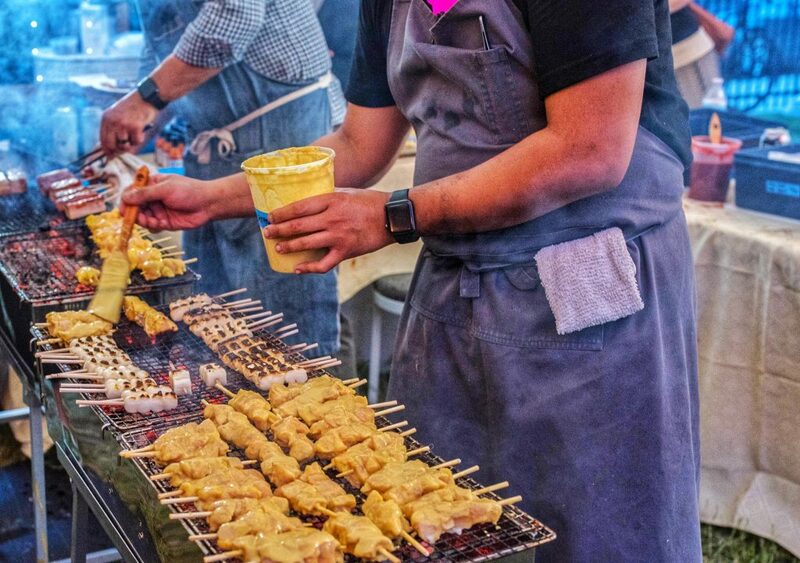 I kept going in line for Kaliwa’s skewers (no shame). They had three types of skewers. 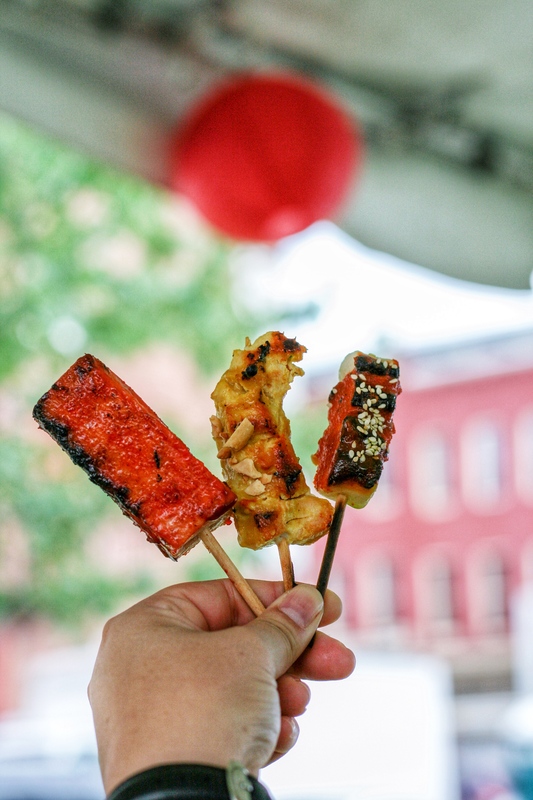 I gotta say the Filipino BBQ Street Skewers (the pork belly one) were my fave. That luscious pork belly fat mixed with the meat…. marinated in homemade banana ketchup… smoked on the spot…. mmmm…. Dave wasn’t really a fan of that skewer (he doesn’t like a lot of fat in his food), so he handed his over to me, and I gladly ate it. photo credit: Kim from @nomtasticfoods. Website here. My favorite girl, Gina, the head bar manager at Wit and Wisdom, was killin’ it with Alex, from Ida B’s Table, at the bar area. They were slinging drinks left and right. 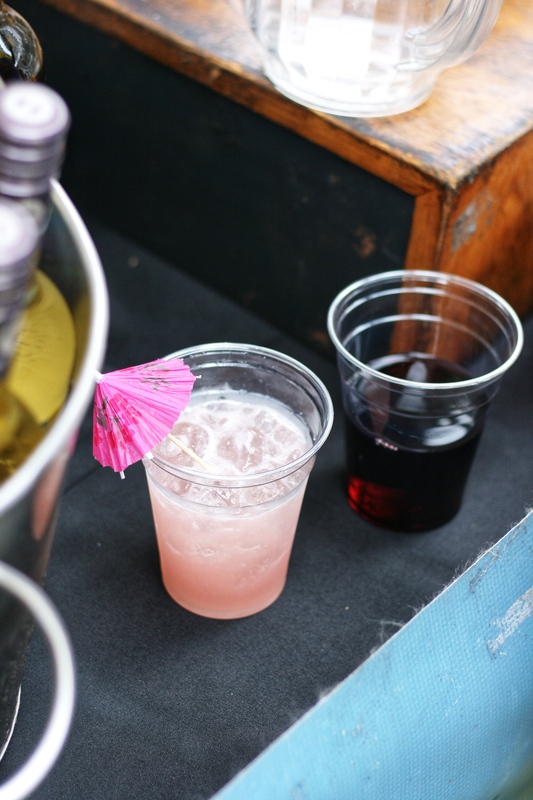 The drinks you could order were boozy Thai ice teas, melon pop margaritas, and Suntory high balls. FYI, Dave and I kept going back for drinks ahahaha. 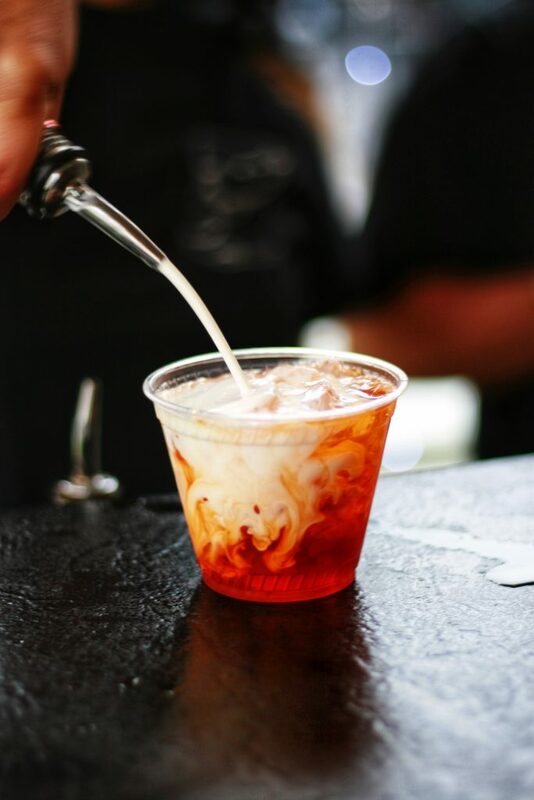 Our favorite was the boozy Thai ice tea! 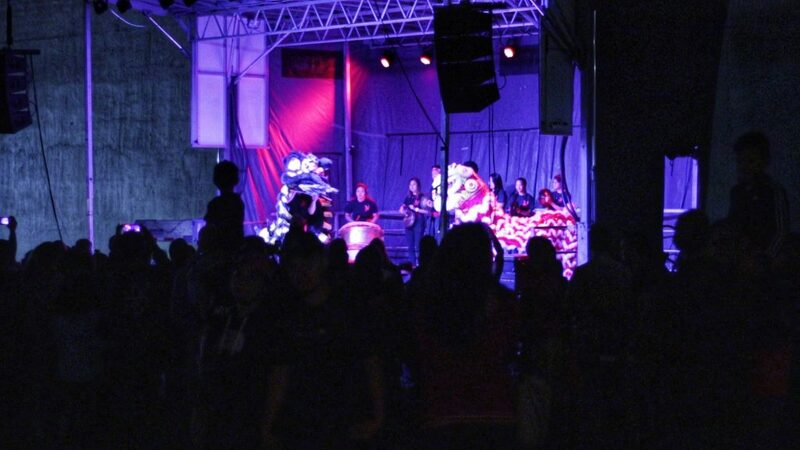 We didn’t party all night long so we didn’t get to see all of the performances, but we did watch the lion dance. 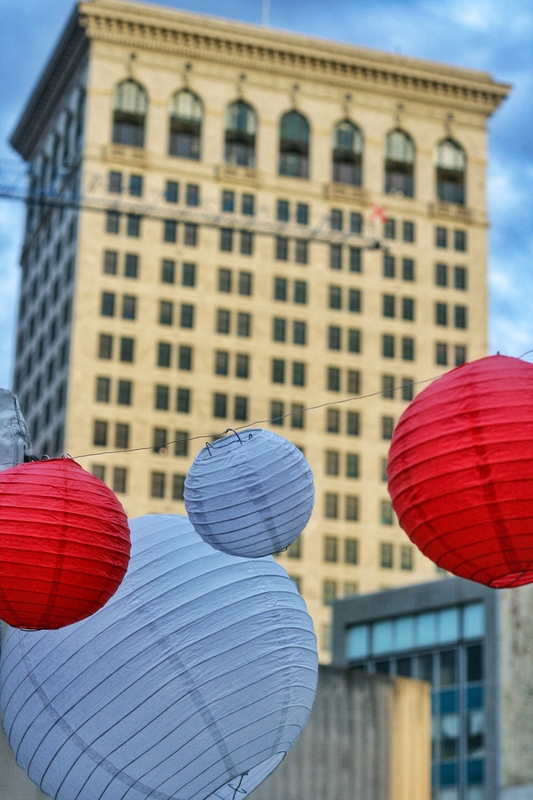 Not sure if the Chinatown Collective planned this, but the Chinese Mid-Autumn Festival aligned perfectly well with the date of the Night Market (Night Market took place on September 22nd. The Chinese Mid-Autumn Festival was celebrated on September 24). It would be weird not to have a lion dance, which is, according to Wikipedia, “a traditional dance in Chinese culture in which performers mimic a lion’s movements in a lion costume to bring good luck and fortune. The lion dance is usually performed during the Chinese New Year and other Chinese traditional, cultural, and religious festivals”. In addition to all the lion dancing, the dance is accompanied by the music of beating drums, cymbals, and gongs, which are synchronized to the lion dance movements and actions. So overall, it was such a fun experience. 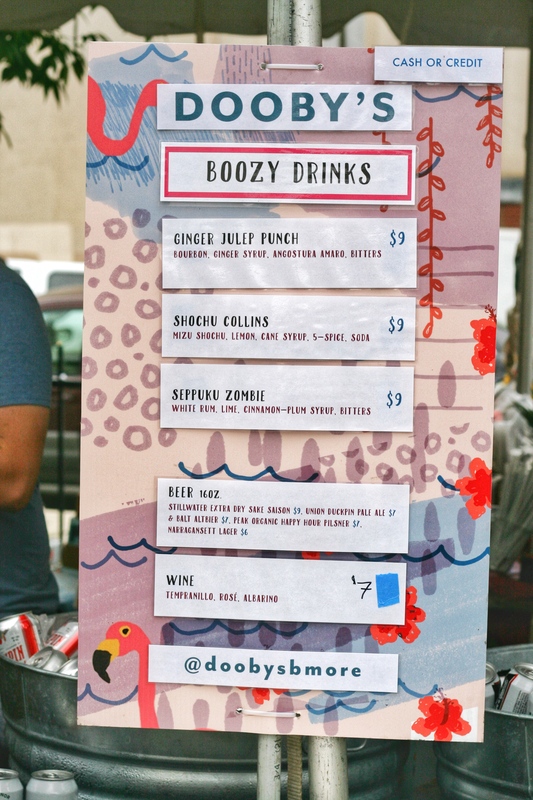 On a personal level, the Charm City Night Market really hit close to home. I think other Asian Americans/Pacific Islanders can agree with me that although we’ve always been here, we hardly ever get noticed or represented. And I’m not talking about as individuals. I’m talking about as being an Asian/Pacific Islander. And you’d think with Baltimore having a Chinatown area (yes, well, we had a Chinatown area… which was where the Night Market took place! You can read more about it in Jesse Wu’s article that I linked all the way to the top. Really hoping this will revitalize this area again!) that wouldn’t be the case, but it is. 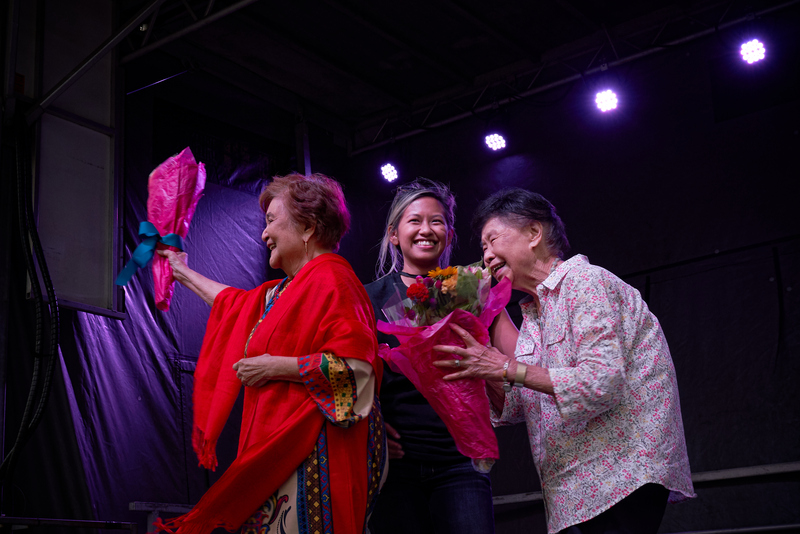 I think the Chinatown Collective did a phenomenal job having others experience the Asian culture and for Asian Americans/Pacific Islanders to be recognized in public way. For example, our emcees were two Asians!!! 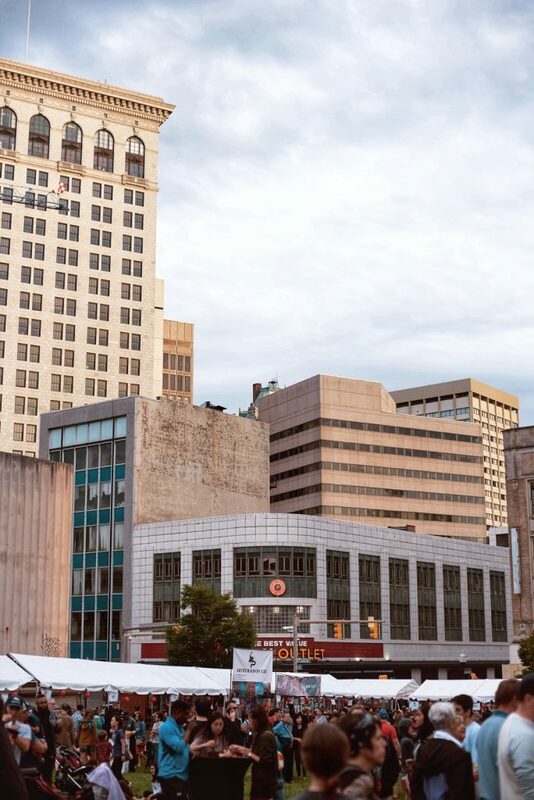 Do you ever see that at a public event!? No!!!!!! Eliza, a style blogger on Aesthetic Distance, and Danny killed it on the stage. This event was strong. It was powerful. Honestly, the feeling flowing through me when I saw the amount of people at the Night Market was overwhelming on an emotional level. Although I only helped out by throwing a fundraiser with my co-partner of the Baltimore Brew Club, Andrew Young, at Suspended Brewery (by the way, Suspended did an amazing job hosting with us the Charm City Night Market Fundraiser too), just knowing I did something to help this event come to life was a mix feeling of pride for not only my friends (The Chinatown Collective: Stephanie, Leandro, Charlie, Erica, Pam, Harrison, Jamie, and Marisa) but for the Asian culture I grew up with along with my American upbringing. 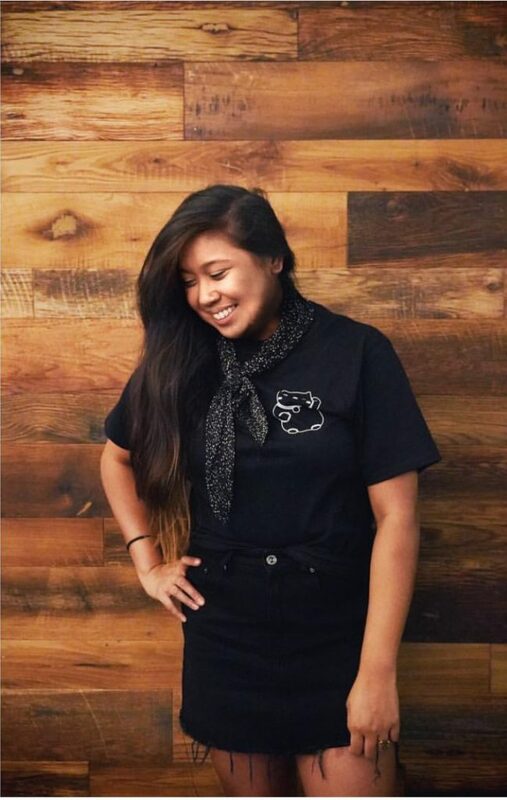 I really don’t know how to describe the feeling of finally feeling recognized, represented, and appreciated as an Asian, but the feeling is overwhelmingly amazing, for lack of better words. Also, huge shout out to everyone who allowed me to use their pics since I failed taking shots that night. Ya’ll are the best!